Yesterday I received a copy of the Order of National Consumer Disputes Rederessal Commission on an Appeal filed by State Bank of Mysore against the decision of State Commission of Karnataka in case of original petition by S K Vidya. I myself being a Law graduate from Delhi University, have a keen interest in reading such judgments. A full reading of judgments of apex courts like Supreme Court and National level consumer commissions is certainly a great pleasure as it gives lot of insights about the thinking of the petitioners and respondents and as to how to interpret law and read between the lines. Such judgments become milestones for the future references. This case is also likely to be one of such cases. As one goes through the full judgment, one gets a feeling as to how IBA and Banks are heartless and have raised petty issues in denying 2nd pension option (that too after paying a hefty price for the same) to an officer who has dedicatedly worked for over 25 years. I felt pity while reading the arguments of the Bank which frankly speaking did not have any weight and one can feel were raised just for the sake of harassing the officer in question. I am sure from the heart, even the Advocate of the bank must be aware that he is going to fight a losing battle and must have agreed to take up this case either to merely oblige the bank or get a fee in return. The appeal appears to have been preferred so that matter can be delayed as much as it can be so that officer is harassed to the maximum extent. I am sure some of you must be cursing me as to instead of discussing the real topic, I am vetting my anger. I apologize to my readers, but I find it extremely difficult to contain my anger in writing, when I find injustice is done and people are harassed inspite of they being honest and sincere. "14. Perusal of the written objections filed by the petitioner before the District Forum, memorandum of appeal filed while challenging the order of the District Forum before the State Commission and the revision petition now filed before us makes an interesting reading which shows that the petitioner itself is not sure of the reasons or grounds based on which the claim of the complainant could be rejected". This is nothing short of slap on Bank management and IBA as they failed to make up any case for rejection of 2nd Pension option in this case. The judgment also further reads as :"We have also noticed that no specific reason has been put forth by the petitioner Bank either before the Fora below or before us as to why the petitioner who had put in 25 years of service before taking retirement under the Exit Policy Scheme would not be entitled to exercise second option ........... there is no specific exclusion of the employees who had retired under the Exit Policy Scheme which would bar them from exercising the second option for pension scheme. ..............Indian BanksAssociation which was opposite party No.2 before the District Forum and being aggrieved by the order of the District Forum had earlier gone in appeal challenging that order along with petitioner Bank, significantly did not challenge the impugned order of the State Commission which upheld the order of the District Forum. In fact, the petitioner Bank itself chose not to implead the Indian BanksAssociation even as a respondent and it was only by a later application that the Indian BanksAssociation was impleaded as respondent No.2 in the petition. All this demonstrates weakness and fallacy in the stand taken by the petitioner Bank while challenging the impugned order. It also needs to be appreciated that in this case when the settlement is signed by a number of parties, the interpretation of the provisions of such settlement cannot be left to the sole discretion of the Indian BanksAssociation alone. "..... 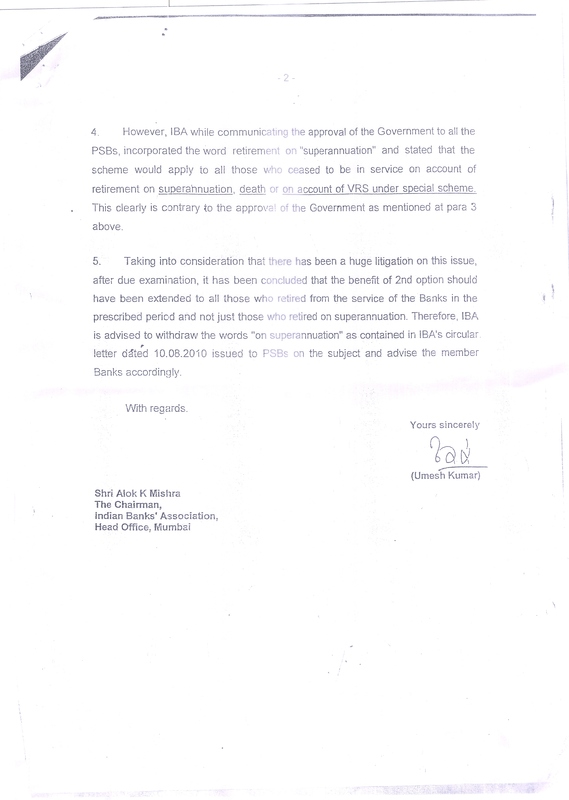 In the absence of any averment to the effect that the clarification given by the Indian BanksAssociation (Respondent No.2) is based on any further consultation held by the Indian BanksAssociation with the workmen unions regarding denial of the option or non-availability of giving fresh option for pension scheme of the complainant, the clarificatory letter of 26.8.2010 cannot provide ground/basis to the petitioner Bank for denying the claim of the complainant. In any case, it is important to note that the Indian BanksAssociation itself has not challenged the impugned order by filing a revision petition against it. 17. In the aforesaid circumstances, we do not see any illegality, material irregularity or jurisdictional error in the impugned order which would call for our interference with it. Consequently, the revision petition fails with the parties bearing their own costs. (b) UFBU and union leaders who were signatories to the Joint Note etc. failed to take up head on the IBA on this issue, rather at the initial stage they blocked the attempt of retired bankers to fight with IBA in courts. It was only later on, when pressure from this section mounted, that they decided to make a lip service, but never joined the retired bankers in Court cases and expose IBA. This gives a sense that they were hand in glove with IBA and felt that if retired bankers are also given 2nd pension option at this stage, they will get fully exposed. (d) IBA has now realized that it is on a weak ground and is likely to lose at all fronts and thus preferred not to challenge the order of the state commission. After creating chaos for Banks and the Retired bankers, it has left its member banks in the lurch to fend themselves in Courts. Although IBA was the signatory but it did not discourage State Bank of Mysore to not file an appeal, but may be have encouraged to linger on the issue so that the people who manipulated the terms get retired and later on no action can be taken. Thus, now IBA may not directly fight the court case but may ask Banks to appeal against such decisions in Supreme Court or try to delay the matters by seeking clarifications and giving different interpretations by paying hefty fees to the lawyers for twisting the facts. 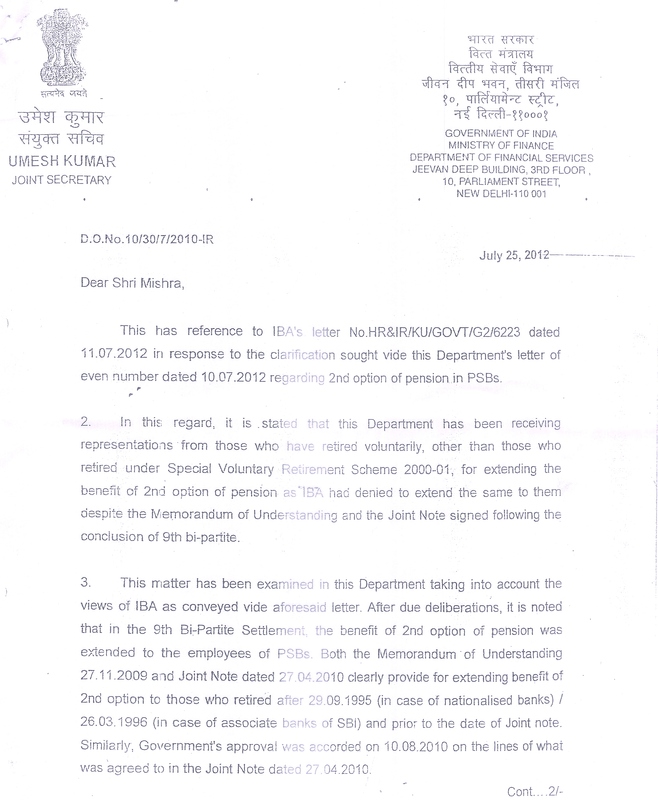 In the meantime we have also received a copy of the letter dated 25th July, 2012 of Ministry of Finance, advising IBA to withdraw the words "superannuation" and allow 2nd pension option. In the end I will like to congratulate the bankers who are still waiting for formal orders for 2nd Pension option.